SHINE (SpHere INfrared survey for Exoplanets) is a large scale direct imaging survey performed with the second-generation high-contrast imager VLT/SPHERE on the guaranteed time of observations (GTO). With a total number of 200 nights, the goal is to perform a census of young giant exoplanets in the Solar neighborhood. 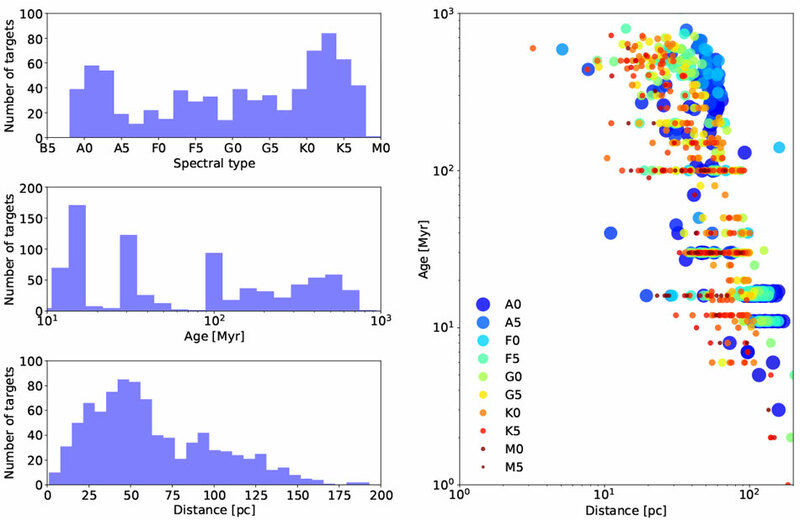 The complete sample is constituted of more than 800 stars (see plots below) categorized in 5 priorities, with the highest priority given to the youngest and most nearby stars. We aim at observing the 400-600 stars with the highest priority at the end of the 200 nights. All the observations are performed during 1 to 2 hours with an apodized pupil Lyot coronagraph (APLC; Soummer 2005) in angular differential imaging (ADI; Marois et al. 2006). Data are obtained in parallel with the integral field spectrograph (IFS; Claudi et al. 2008) and the infrared dual-band imager in spectrograph (IRDIS; Dohlen et al. 2008) in dual-band imaging mode (DBI; Vigan et al. 2010). This unique instrumental setup enables covering the whole near-infrared in a single shot to maximize the efficiency of the observations. The data are then analyzed at the SPHERE data center (SPHERE-DC) hosted in Grenoble (France), and with individual pipelines when focused studies are performed. The pipelines derive final images, detection limits and astro-photometry for all the identified candidates in the images. Additional characterization observations are performed with IRDIS using the long-slit spectroscopy mode (LSS;Vigan et al. 2008) for sub-stellar companions or using the dual-polarimetry mode (DPI; Langlois et al. 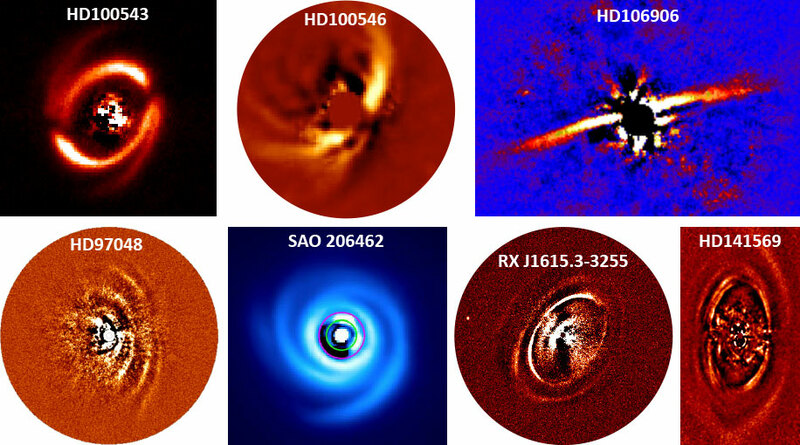 2014) for circumstellar disks. With a field-of-view diameter of more than 8", the IRDIS/DBI mode offer a high probability of contamination by background stars (see e.g. Chauvin et al. 2015). After 3 years of survey, we have detected more than 2000 candidates around 132 targets. The plot at the right shows all of them in a color-magnitude diagram (CMD) for the IRDIS H2H3 DBI filter pair. An important part of the work, for which I am the SHINE responsible, is the identification and classification of all these candidates. There are 3 possible ways to determine the status of candidates: using two (or more) SHINE epochs separated by at least a few months, using SHINE measurements in combination with archival data (e.g. 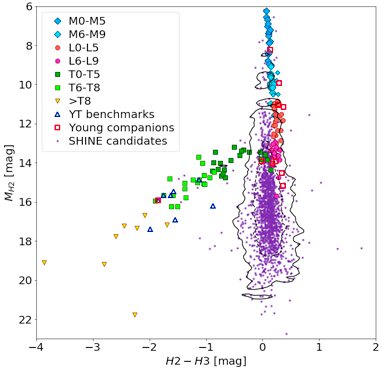 from DIVA) or excluding some candidates based on their color and absolute magnitude in CMDs. By combining these different methods, we managed to determine that 241 candidates (10.7%) are background, 32 candidates (1.4%) are companions (know or new, stellar and sub-stellar), 19 candidates (0.8%) are ambiguous and the rest is undefined. Additional selection criteria are now considered to reduce the number of interesting candidates and hopefully obtain an almost complete status by the end of SHINE in 2019. A major result of SHINE is the discovery of a new giant exoplanet around HIP65426 (Chauvin, Desidera, Lagrange, Vigan et al. 2017). The A2 star is a member of the young (~17 Myr) Lower Centaurus-Crux association, at a distance of 111 pc. 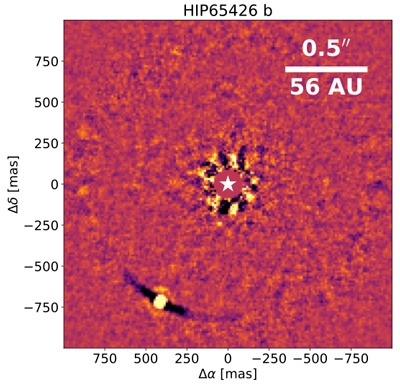 Interestingly, and contrary to most imaged exoplanets host stars, HIP65426 does not exhibit an infrared excess. The star was observed for the first time in May 2015 as part of the standard SHINE campaign, revealing the presence of a point source at a separation of 830 mas and a contrast of ~11 mag in H-band. New observations in February 2017 confirmed the common proper motion and the planetary status of the candidate. Spectro-photometric measurements from the IFS and IRDIS between 0.95 and 2.2 μm indicate a warm, dusty atmosphere characteristic of young low surface-gravity L5-L7 dwarfs. Hot-start evolutionary models predict a luminosity consistent with a 6-12 MJup and Teff = 1300-1600 K. New observations are already foreseen to better constrain the SED and the physical parameters of this new giant planet orbiting at a projected separation of 92 AU from its host star. Finally, with its wide field-of-view and its polarisation capabilities, SPHERE/IRDIS is a unique instrument to detect and study protoplanetary and debris disks. Below is an (incomplete) gallery of some of the images obtained with SPHERE in SHINE and in the disk GTO (20 nights). SHINE is a large collaborations with several dozens of contributors. SHINE coordination team: Gaël Chauvin, Silvano Desidera, Anthony Cheetham, Anne-Marie Lagrange, Raffaele Gratton, Maud Langlois, Mickaël Bonenfoy, Michael Meyer. SHINE team at LAM: Hervé Le Coroller, Roxanne Ligi (former postdoc), Alice Zurlo (associated scientist, former PhD student), Zahed Wahhaj (associated scientist). Other close collaborators: Mariangela Bonavita, Beth Biller, Dino Mesa, Julien Milli, Jos de Boer.